but we are not like God. He has always existed in the same way: fully and completely as God. 6 Before the throne there was a sea of glass, like crystal. And in the midst of the throne, and around the throne, were four living creatures full of eyes in front and in back. 7 The first living creature was like a lion, the second living creature like a calf, the third living creature had a face like a man, and the fourth living creature was like a flying eagle. 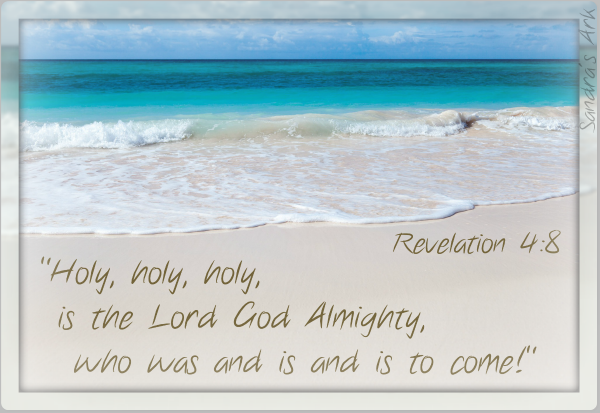 Have you grasped the "who was and is and is to come" ? 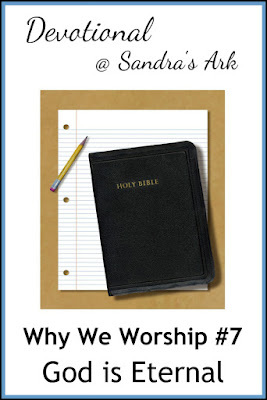 Do you worship Him even though you may not fully understand Him? I absolutely love this because we worship because of who God is:) He is eternal and amazing and this post just made me smile huge! thank you! Thank you and I am glad you smiled, we need to do more of that while we worship him. I was just thinking about this the other day... He IS eternal... And is, was, and yet to come. How awesome and powerful is THAT?? Hi again Sharita, love linking up at #EverydayJesus and thank you for the encouragement. Hi Susannah, I enjoy linking up with the Faith & Fellowship blog hop, great way to meet other likeminded bloggers and to read other good posts. I'll think about the co-hosting . This is so powerful! And so true. He is worthy of our praise. 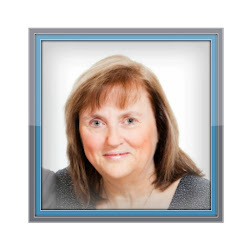 Hi Charlene, nice to meet you, and I sort of really have as I have just hopped over to your blog and read your last post and left a comment. Then I added you to my circles. Thanks for your encouragement, hope to see you again. I really am loving this series. I love those words... who was and is and is to come. Such comfort in those words and yes we should worship Him because of this truth. Wishing you a wonderful weekend, Sandra. Hi again Beth, I so enjoy doing it myself, sets me up for worshipping at church on Sunday mornings because I focus on what I have written for this each wee. It is good to be focused to prepare our hearts for worship. i read somewhere once "we were made to worship. so 24/7 we are worshiping something. 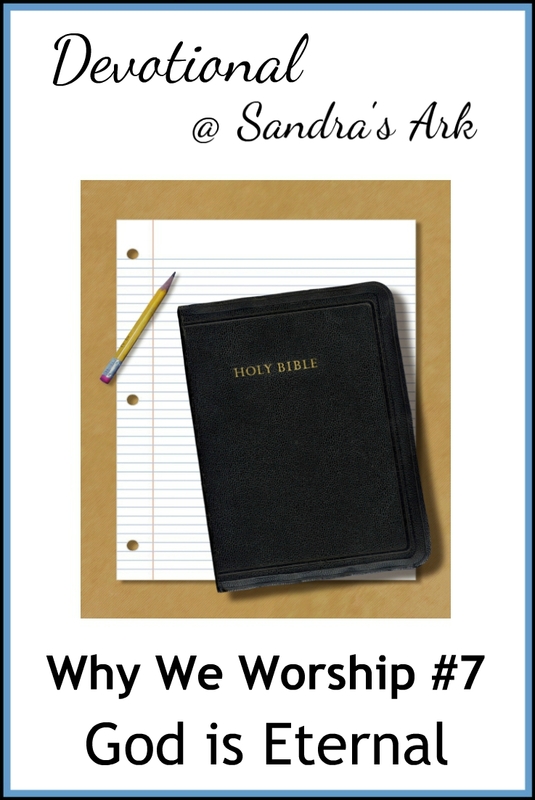 if you're not worshiping God, then you are worshiping an idol" - i have always remembered it because it's a good reminder! Hi Anita, thanks for dropping in from Spiritual Sundays. I thoroughly agree He is amazing and He loves us, fantastic. Whenever I read Revelation I am blown away by this truth! So exciting! Hi again Mel, you know I enjoy Essential Fridays and I love this truth as well. I have lived in Revelation so many times, and that is what keeps me focused in Him. The world issues can drive me/us nuts, but concentrating on the fact that we will be with Him forever and He's the only One we can rely on. That's my goal... Thanks for sharing so straightforwardly. A necessity in our world. Thank you again for your encouragement, indeed we must say what we mean and mean what we say. Our lives should be worship - every single day. 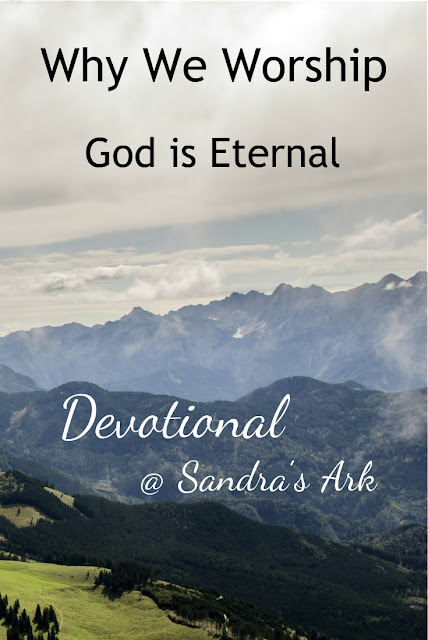 hi there, eternal is way beyond my scope of understanding but this certainly is the time of the lead up to when He made it possible for me to have that eternal life. perhaps you might consider adding a worship song to my #SONGSonSUNDAYS meme ? This is so amazing, I was just thinking last week how each Sunday during our church worship there has been at least one song centred around the attribute I had been focusing on so I was thinking of doing a series later on Songs but I didn't know that you had something so I must investigate yours again on Sunday. I LOVE that verse in Revelation! Thanks for linking up with Woman to Woman's Word Filled Wednesday! God bless! visiting from weekend brew today - I love the visual you have used for the eteranlity of God. Waves always make me think of God's love and how it keeps on coming no matter how I feel, what is happening around me or what will happen...it just keeps coming. "Who was and is and is to come" beautiful life-giving words. you remind me of a post that has only been in my mind about these words.! Beautiful! He is worthy of our praise! Visiting from A Wise Woman Builds Her House. And it just blows my mind every time I try to imagine it. I'm so grateful He is more than I can wrap my mind around. Did I Tell You How Much I Love LISTS?